Manufacturer of crewel fabric, bedspreads, pillows, rugs, silk carpets, embroidered coats, jackets, pashmina shawls, scarfs, salwar kameez, dressing gowns, kaftans and paper mache items. 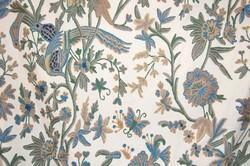 By the yard Crewel Fabric, Hand-Embroidered in traditional patterns by Kashmiri craftsmen. 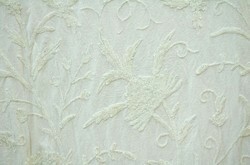 Shown here is Crewel Embroidered Fabric, Birds Crewel, Off-White Cotton Background, Blue and Grey Wool Embroidery. 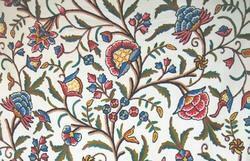 By the yard Crewel Fabric, Hand-Embroidered in traditional patterns by Kashmiri craftsmen. 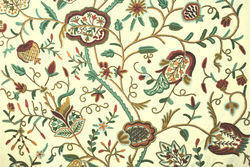 Shown here is Cotton Crewel Fabric, Beige Background, Multicolor Wool Embroidery.